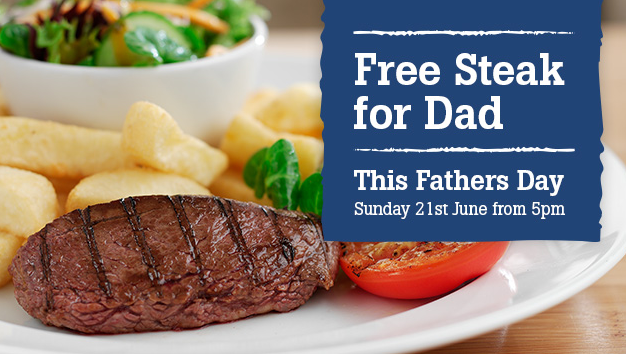 Beefeater is celebrating dads all over the country this Father’s Day by giving them a free steak on their special day of the year. There’s no better way to thank your dad with one of Beefeater’s deliciously tender steaks that are packed full of flavour and cooked to perfection. Famous for dads’ favourite dish, steaks, Beefeater continues to offer a selection of the best cuts, cooked to sizzling perfection. Each mouth-watering Beefeater steak is primed for greatness; aged for exactly 21 days and then grilled by specifically trained chefs. Meat lovers can choose from a wide range including a lean and tender ’74 signature steak’, a centre cut ‘8oz sirloin’ that balances leanness with a juicy flavour and a ’10oz Rib-Eye’ super succulent steak. Beefeater is a British brand that first fired up the grill in 1974 and now has over 140 restaurants nationwide. It’s all about affordable quality and has great value always-on offers, catering for all manner of tastes. Steak and chips start from just £9.99, Daytime Menu dishes start from £4.99 Monday – Saturday before 6:30pm and with kid’s eating free every Saturday between 12-5pm, a visit to Beefeater won’t break the bank either. The offer is valid when you book a table after 5pm and one full priced main meal is purchased from the main menu at the same time. Steak upgrades are charged, please ask in restaurant for more details.